“What do you remember most about childhood” was what was written on a notecard handed to the people attending the screening for Richard Linklater’s opus Boyhood. Thinking about the question caused some conflict within me for the inherent challenging nature of such a vague question. There is a lot of difficulty in zeroing in on the one thing out of your childhood that resonates the most. Reflecting on this question I could only revisit my past in spurts and interludes of brief standout moments. Linklater’s Boyhood does the same. It’s sweeping and sporadic, jumping from year to year sometimes in a blur. Boyhood tells the story of the evolution of Mason, Jr (Ellar Coltrane) over a 12 year period, starting from age 6 and going on until he hits 18. The film was shot over a 12 year period starting in 2002 for a few weeks out of every year. Mason’s parents are divorced. His mom Olivia (Patricia Arquette), is his and his sister Samantha’s (Lorelei Linklater) primary caretaker. His dad Mason Sr (Ethan Hawke), visits inconsistently whilst trying to hold on to dreams of being a musician and the cool dad. We watch Mason move from house to house for reasons ranging from money, to opportunities for his mom to advanced to second marriages to abusive drunks. over the course of a little under 3 hours you’re watching people, children especially, grow older before your eyes and you start to care about them as your own. You bring your own childhood experiences to the film and, despite personal differences or experiences, this is a universal story. The film moves like childhood moves: quickly and sometimes hastily. If it wasn’t for the fact that kids change so dramatically in those developmental years, you’d never notice that time had gone by. Linklater knew this and made a film that tailored to how these people age, what life does to you in this time period and how you change. As a technical showcase of filmmaking, Boyhood is outstanding. Every shot feels purposeful and focused. The film glides from point A to point Z without tripping or getting too caught in its own importance. Unlike say Before Sunrise or Slacker, this is not a movie meant to display its own intelligence and outlook on life in a direct manner. It’s a movie in which life speaks for itself. 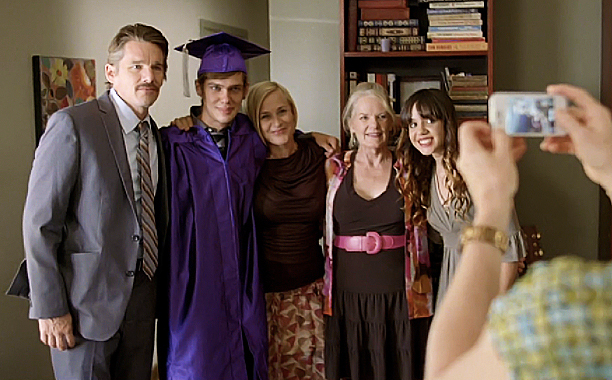 As a story, Boyhood is heartbreaking and charming. Patricia Arquette is given so much to deal with and it’s hard to watch what she goes through and not feel for her. She is given the role most mothers are given: the most thankless one. Watching her go through school and ultimately become a professor should be a triumph but it never feels that way, instead it always feels like there’s more she has to do. Ethan Hawke nails a character that Ethan Hawke knows how to nail; the guy trying to hold on to being cool. Throughout the film, he disappoints his children and comes up short all in the name of chasing a dream. It’s almost like he uses being hip as an excuse for being lackluster, like if he can convince these two kids that he’s awesome they might forget that he’s not very existent in their lives. And yet, when he does finally get a thankless job selling insurance, remarries and trades in his old school Mustang for a minivan, you feel bad for him. You know that he gave up even though it’s never said or discussed. That’s part of his finally joining adulthood: giving up. The real gut punch lies with the kids though. Watching both Mason and his sister Samantha get older before our eyes and battle the trials of adolescence is endearing. They’re angst ridden and obtuse but you get it and you want the world to give them a moment to breathe. With Mason specifically, you want him to be allowed to fly free like the bird he wants to be, but that’s not the world. You think back to your own adolescence and how oppressive in nature the adults are in your lives. Preordaining a path for you, taking out frustrations on you and telling you who to be as a person. This is Linklater’s deal. From the many pseudo-intellectuals of Slacker to Jason “Pink” Floyd in Dazed And Confused, He’s always told the story of kids who don’t get the world, who don’t fit in and who just want to find some kind of real answer. Near the end, Mason’s mother breaks down as he prepares to leave for college, and in her fit of tears she says, “I just thought there’d be more”. It’s the most heartbreaking and weighty line in the film and it’s never answered. There’s no moment of consoling or reassurance, it’s just there for you to take in. That’s the bittersweetness of this film. There are no answers to your questions. You feel pain, you feel pleasure and you wonder whether any of it meant anything at all. You’re always chasing a fulfillment that never comes. Things just happen to these characters and there is no time for pause or reflection, life always goes on. To paraphrase one character near the end, “you don’t really seize the moment, the moment seizes you”. Boyhood is about the moments the seize you and mold you into who you become. It’s messy, beautiful and chaotic and in the end I just wanted to relive it one more time, just like childhood.